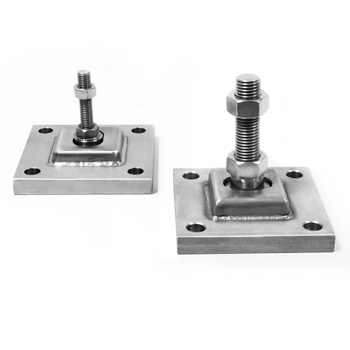 Articulated plates for shear beam load cells, SBK o SBX models. Useful for fixing the cells to the floor or to rigid structures, and for the creation of weighing systems with several support points. Threading M12, thread lenght 52mm. STAINLESS steel structure (AISI 304). Fixing plate dimensions: 120x120mm (lxw). Fixing holes diameter: Ø = 14mm. Applicable on SBxx series load cells, from 3000 to 5000kg. Threading M20, thread lenght 65mm. KSB2H Stainless steel articulated plate with M12x50 threading. Applicable to SB.. load cells with capacity up to 2000 kg. To combine with BLKM12I bush. KSB5H Stainless steel articulated plate with M20x65mm threading. Applicable to SB.. load cells with capacity from 3000 to 5000 kg. To combine with BLKM20I bush.